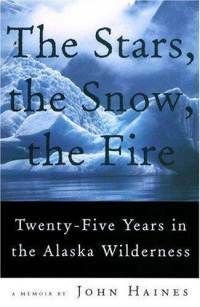 I will be haunted by John Haines 's The Stars, the Snow, the Fire for many years to come. The ease (or grace) with which he handled the brutality of hunting and trapping lulled me into a deceptive calm, but his imagery was too graphic to pass by without a reaction. However, his essay Ice was one I read over and over, not because it was violent, though that brand of his writing was present, but because there was a certain rhythm to the storytelling in Ice that made me want to read it again, deeper, slower, searching for something, a rhythm generated by the way he related time and space. Many of his essays are told from the here and now, a bold tense. Ice is no different. Haines begins by dropping the reader to her hands and knees in the snow to find the places "away from the sun, in ravines and hollows where the ground is normally wet." In these places, "the soil has darkened and is hard and cold to the touch. The deep, shaded mosses have stiffened, and there are tiny crystals of ice in their hairy spaces" (Haines, 126). Every word generates a sensory experience. I can see, feel, even smell these dark places. Haines snaps from that sequence to thoughts of the river. The heavy frost reminds him that the river is changing. "The sound of that water, though distant, comes strong and pervasive over the dry land crusted with snow: a deep and swallowed sound, as if the river had ice in its throat" (Haines, 126). He takes "the steep path downhill to the riverbed" and stands at the shoreline where, "Free of its summer load of silt, the water is clear in the shallows, incredibly blue and deep in the middle of the channel... Here where the current slackens and deepens, the water is heavy and slow with ice, with more ice and more ice" (Haines, 127). With all her senses, the reader is deep in the present tense. Which is why Haines moves suddenly to a recollection of the past, the way memories come to all of us. Memories are sparked by a sound, a scent, even the feel of a certain material against the skin. In this case, the color of the water and the smell of the ice remind Haines of "past years when [he] came to a channel much like this one, in mid-October with only an inch or two of snow on the gravel bars, to fish for salmon" (Haines, 128). He describes the way he "watched for the glowing red and pink forms of salmon on their way upriver in the last run of the season, "and then the way his gaffing hook "made a nasty gash in the side of the salmon, and fish blood soon stained the snow where [he] piled them, one by one" (Haines, 128). That memory reminds him what it felt like to be part of "something grand and barbaric in that essential, repeated act... a feeling intensified, made rich by the smell of ice and cold fish-slime, by the steely color of the winter sky, and the white snow stained with the redness of the salmon: the color of death and the color of winter" (Haines, 128). Caught up in the current of that memory, the reader thrashes for something to hold onto and finds it in a return to the present tense. Haines is again standing on the shore and repeating that "the sound of the water and the ice before [him] is one sound, familiar over the years" (Haines, 129). But like the grasp on a boulder midstream, this grasp on the present is slippery, and the reader is pulled back to the past once more, "Years ago while hunting caribou in the Alaska Range" where Haines "heard the oldest lament of the ice... A muted and forsaken moaning from lakes and ponds. It was a sound out of prehistory, of something deeply wounded and abandoned" (Haines, 129). Before closing Ice , Haines pitches the reader into the future briefly, too, prophesying the return of a "great silence" when "The wind will bring its dry snow to polish the new ice and turn it into a great slick and glare... And over the renewed expanse of ice there will be silence again, the silence of ice, unchanged since the first winter of Earth" (Haines, 130). But he doesn't remain there. Instead, he brings the reader, and therefore his message, home. Together, we "turn and walk back to the home shore" (Haines, 131). "Here and there a pebble of quartz is gleaming. But nothing moves here. It is a still, cold world, something like night, with its own fixed planets and stars" (Haines, 131).